Hartelijk dank aan onderstaande genealogische verenigingen en websites die ons een award toekenden. Het stimuleert ons om GeneaPage zo goed mogelijk verder uit te bouwen. Daarnaast is er ook de GeneaPage Award voor verdienstelijke genealogische pagina's met een Limburgse inhoud. 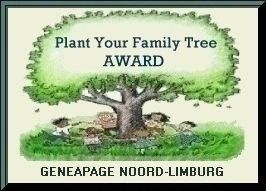 Your site has been selected to receive the Plant Your Family Tree Award. 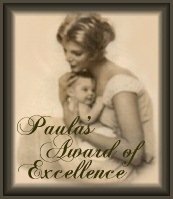 I enjoyed my visit to your site very much and would like to thank you for helping preserve family history. 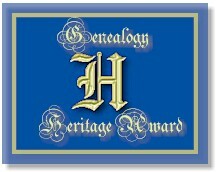 Congratulations, I am pleased to award your wonderful site my "Genealogy Heritage Award". Thank you for your contribution to genealogy! In reviewing your site we have found it to be of high quality and value.This award is given to outstanding webpages with excellent design and graphics. "I have enclosed a gift for which you cannot apply but is awarded to those few outstanding sites that are worthy." You have done a very nice job with your graphics and layout. Your content is informative, entertaining and presented well. What a well-thought-out and valuable website! You should be very proud of the work you have done. Had a great time looking over your site. Thank you so much for taking the time and effort to put your information online for everyone. 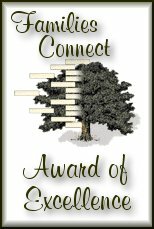 We are very pleased to award you the Genealogy Park Award for Excellence. Thank you for inviting me to visit your wonderful website! You have done a great job and are truly deserving an award! Please keep up the good work and thank you for sharing! Connie. You have a wonderful site. It is evident the amount of work and effort you have put into it. Please accept this award for your contribution to genealogy on the internet. Congratulations. I am pleased to award two of them to you. Congratulations! Your site is an asset to the genealogy community! De website ziet er zowel bij de res. 800x600 als bij res. 1024x768 goed uit en de teksten zijn goed leesbaar. Er staat veel info op de site en de inhoud is duidelijk en overzichtelijk gepresenteerd. De opmaak van de teksten met korte alinea's gescheiden door een witregel en (soms) tussenkopjes is prima.U hebt een mooie en interessante website gemaakt. Wiij vinden dat deze website in aanmerking komt voor onze Golden Award. Congratulations! 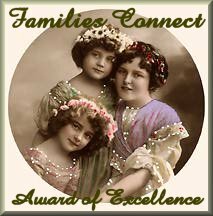 I am so pleased to award to your site both of my genealogy awards. I found your site very appealing and an asset to the genealogy community!! Keep up the terrific work!! Happy Researching! !